Highly regarded for his ability to reinvigorate his own artistic techniques and forms, Zeng Fanzhi’s art works explore line and control, time and singularity and the interplay between concealment and display. He has grappled with these themes with fierce independence and endurance throughout his career. This exhibition, named after a graphical line singled out from Zeng’s work, examines the manner in which the artist manipulates texture to render subject matter both as layers of memory and of paint. Comprising 9 artworks, Zeng Fanzhi Line presents a selection of paintings, sculpture and works on paper produced by the artist over the last quarter century. 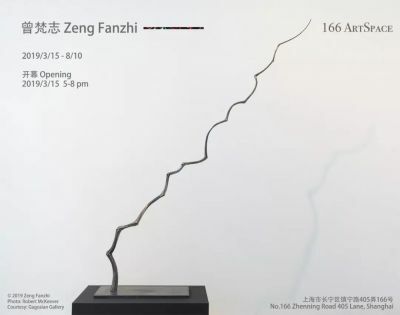 Widely credited for his engagement with the historical discourse on art both from the East and the West, Zeng has become one of the most renowned and recognizable names in the practice of contemporary art today. We are honored to make a contribution to this conversation through an exhibition in which the artist’s breadth, complexity and insight are on rich display. Zeng Fanzhi was born in Wuhan, China in 1964, and lives and works in Beijing. Solo exhibitions include: “Zeng Fanzhi: Idealism,” Singapore Art Museum, Singapore (2007); “Zeng Fanzhi,” Musée d'Art Moderne de Saint-Etienne de Metropole (2007); “Zeng Fanzhi,” Fundación Godia, Barcelona (2009-2010); “2010: Zeng Fanzhi,” Rockbund Art Museum, Shanghai (2010); “Zeng Fanzhi”, Gagosian Gallery, Hong Kong (2011); “Zeng Fanzhi”, Gagosian Gallery, London (2012-2013); “Zeng Fanzhi: Paintings, Drawings and Two Sculptures”, Gagosian Gallery, New York (2015); “Zeng Fanzhi: Parcours”, Ullens Center for Contemporary Art, Beijing (2016); and “Zeng Fanzhi | Van Gogh”, Van Gogh Museum, Amsterdam (2017). Conceived as a single show spanning three locations simultaneously in Zurich, London and Hong Kong, “Zeng fanzhi: In the Studio” represents at Hauser & Writh in 2018. His works have also been featured in various group exhibitions, including: the 53rd Venice Biennale (2009); “The World Belongs to You,” Palazzo Grassi, Venice (2011–12); "Prima Materia,” Punta Della Dogna, Venice, Italy (2013); “Ink Art: Past as Present in Contemporary China,” Metropolitan Museum of Art, New York (2013–14), etc. Zeng’s work was the subject of a phased retrospective at the Musée d'Art Moderne de la Ville de Paris in 2013–14. Invited by the specially commissioned exhibition at the Musée du Louvre in 2014, his painting From 1830 till now No. 4 (2014) was shown alongside Eugène Delacroix's Liberty Leading the People (1830).